Fri, Apr 19, 2019, 11:03:04 ---- The fact: 42.844.000 visitors done. T-DRILL Awards Alberta Custom Tee Ltd. T-Drill Industries Inc. 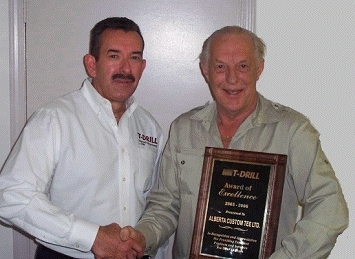 It was announced in late 2005 that Alberta Custom Tee Ltd had won the T-DRILL Industry Award of Excellence for 2005-2006. Alberta Custom Tee has been serving the radiant heat and plumbing industries for over 15 years and continues to provide excellent quality products. At the award ceremony, Mr. Jim Peters, President of T-DRILL Industries, presented Mr. Peter Haas, President of Alberta Custom Tee, with a plaque. Mr. Haas said, This award is for the employees of Alberta Custom Tee," and added that, it would have a special place in the employee break room. Alberta's product line consists of more than 1,000 different copper headers, both standard products and custom made. You can visit Alberta Custom Tee on the WEB at www.customtee.com and T-DRILL Industries at www.t-drill.com.